“Devastation” is the one word that kept coming to mind as I travelled through south-west Haiti, where Hurricane Matthew had passed. It made me think of the landscape in Hiroshima and Nagasaki after the atomic bomb had been dropped. Where there was once a flourishing vegetation, there was now a kind of a desert. There were very few birds and very few animals, the cyclone had devoured almost everything. What remained were a few leafless trees, standing like the masts of ships reaching up to the sky. The rest of them had been uprooted, leaving a sense of emptiness. The ground was soaked through as the rains had continued and created floods. The bare trees meant there was nothing to protect communities from floods and forced them to take refuge. The roads and bridges were still blocked by trees, branches, soil, rocks when I visited. The electricity lines were down. Over 800 people died as a direct result of the hurricane, but most people are facing a hellish survival. 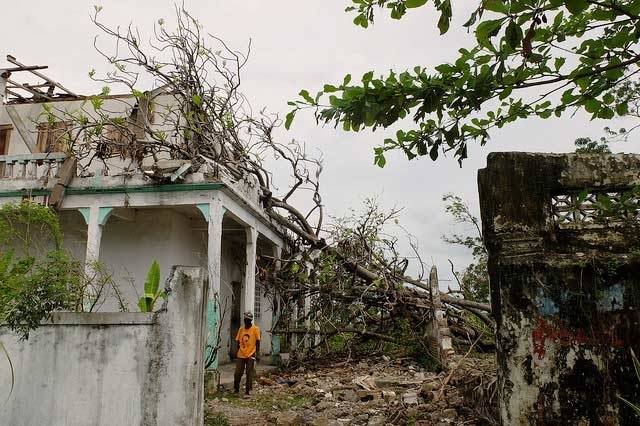 Most of their homes were made from poor materials and were damaged by the storm, leaving people to take refuge in houses which were more solid. Schools and administrative buildings which had remained standing were transformed into temporary shelters. The temporary may become definitive. People who didn’t shelter in these buildings went to Port-au-Prince where they were welcomed by family members. Who knows if they’ll ever go back home. On the south-west coast as well as on the hills or in the mountains, most houses were razed to the ground. Many others have lost their roofs, leaving the people to face the elements. Tarpaulins have been distributed, but far from enough. People prefer to invest in or receive corrugated sheets so they have more protective shelter. There was no shade left for and people were desperately looking for a place to rest away from the sun. Most of the churches, the bishop’s and the parish houses were destroyed, partially or fully. Mass was being said in roofless churches, in the rain and under the sun. The hurricane destroyed the crops. There are no more coconuts on the trees, no more food in the fields or gardens, very few chicken or goats. People are desperately hungry. 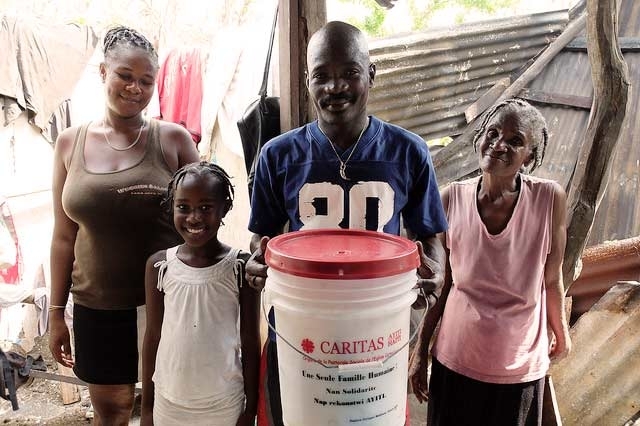 The Caritas family is in Haiti, supporting in particular communities which are in remote places and may not receive help from other agencies. We are trying our best to help people but the needs are great. We have been giving out food kits, hygiene kits, utensils or tools. We are ramping up our programmes and will launch a 3 million Euro appeal for funds soon to finance our longer-term commitment. The situation for many people seems worse than after the 2010 earthquake which devastated the county. Over 2 million people are in difficulty. Everything has to be rebuilt and all the crops replanted. The Haitian people are very resilient. But they need help to survive, including trauma healing, and support in starting a new life. Let us not forget the Haitians. We need long-term mobilisation and dedication. The people of Haiti need a lot of support. Let us not disappoint them. We have a real opportunity to offer global solidarity that makes a difference.